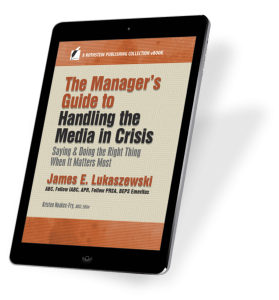 James (Jim) Lukaszewski, America’s Crisis Guru®, is one of the most visible corporate go-to people for companies when there is trouble in the room or on the horizon. 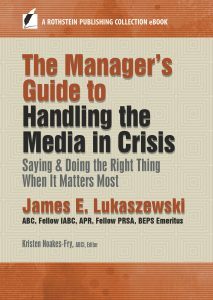 The Manager’s Guide to Handling the Media in a Crisis: Doing and Saying the Right Thing When It Matters Most, shares with you the skills he has developed in 30+ years of helping companies in crisis manage, employee communications, ethics, media relations, public affairs, reputation preservation, leadership restoration, and recovery. Jim speaks annually before a wide variety of local, statewide, national and international organizations and associations heard by thousands of each year – and in this e-book, he is speaking directly to you. Create and deliver the message that best represents your organization. Understand what it takes to be an effective spokesperson. Make sure everyone is aware of company policies and procedures relating to the press. Be aware of the needs, deadlines and priorities of reporters. Prepare to give good answers to all sorts of questions. 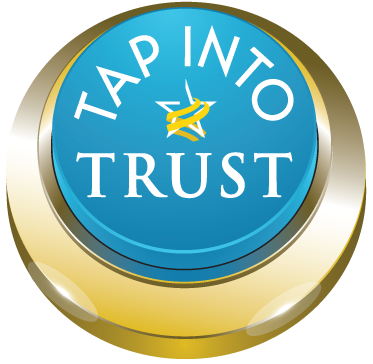 Monitor social media, assess its impact. Identify the ways social media could be used to attack your company. Preserve company reputation amid a flurry of conflicting publicity. Reading this e-book, you will see why, wherever there is or can be trouble and crisis, affected audiences and troubled leaders are waiting to learn the way out of their problems from Jim. The e-book is practical, easy to read, filled with real-world case studies, checklists, anecdotes, discussion questions, and easy-to-remember tips for success.